Disney Cruise Line‘s latest ship, the Disney Fantasy, celebrated a major milestone in the vessel’s construction Sunday, as the ship underwent its test “float out” in the harbor of shipyard. 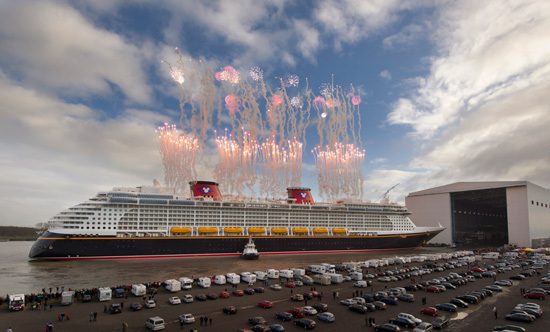 Thousands of onlookers watched from shore as Disney’s cruise ship, which is scheduled to make its maiden voyage this spring, made its way out of the enclosed assembly building for the first time, as fireworks were launched overhead. With the ship prepared for float out, construction will continue on the inside of the vessel, as workers complete details that will provide the Fantasy with her signature Disney magic. The ship’s maiden cruise is scheduled for March 31, 2012, and will depart from Port Canaveral, Florida.